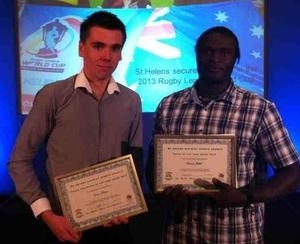 Rainford Tennis Club were celebrating after Samuel Jalloh and Conor Porteus were amongst the winners at the 2012 St Helens Sports Awards. Our Head Coach, Samuel Jalloh won the Coach of the Year award for all his efforts in growing the tennis programme at the Jubilee Recreation Ground, Spinney Park and in local schools. Sam was also commended for his voluntary work in helping underprivileged children in Africa as part of the Sam Jalloh Sports Foundation. Conor was awarded the 2012 Young Volunteer of the Year for all his hours helping tennis in the village. Since completing his Tennis Leaders Award in 2008, Conor has given up his free time to help with coaching and competitions and as part of the Club’s committee. “We are delighted for both Conor and Sam and everyone at Rainford Tennis Club would like to congratulate them on their awards” said Club Chairperson, Helen Bligh.